Boeing Co. is considering whether to convert used 777 passenger jets into freighters, seeking to capitalize as booming e-commerce sales spur new demand for air freight worldwide, people familiar with the matter said. 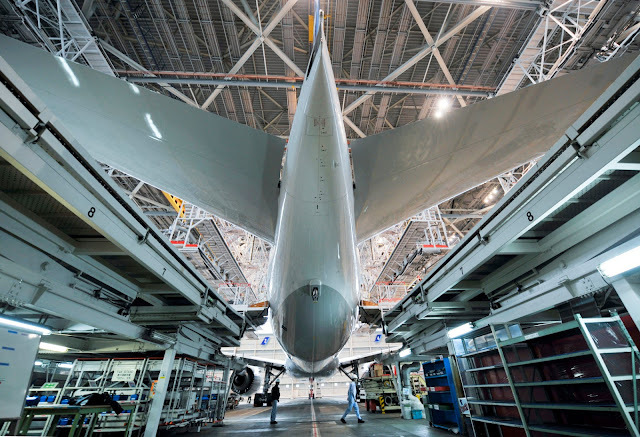 While Boeing has studied retrofitting the used wide-bodies for more than a decade, the effort has taken on new life in recent months as air cargo finally emerged from its recession-era slump, said the people, who asked not to be identified because the matter is confidential. The new product would also fuel sales at a new global services division as Boeing works to more than triple the unit’s $15 billion in annual revenue over the next 10 years. Offering revamped versions of the 777-200ERs would expand Boeing’s catalog of freighters but risk cannibalizing sales of factory-fresh jets at more than double the price. Demand for conversions is growing as online shopping surges and package couriers seek lower-cost alternatives to buying new planes. Air freight is expected to climb 4.5 percent this year, after gaining 9 percent in 2017, according to the International Air Transport Association. Boeing’s freighter lineup currently includes versions of its single-aisle 737 and of the company’s wide-bodies, except for the 787 Dreamliner. Europe’s Airbus SE also is exploring an expansion of its cargo offerings with a version of its slow-selling A330neo twin-aisle jet. Dan Mosely, a Boeing spokesman, declined to comment on its plans for retrofitting 777s but said first-quarter sales of the company’s factory-built freighters were double the total for all of last year. “Across our portfolio of commercial airplanes and services, we are always looking at how we can provide more value to our customers,” he said by email. A looming wave of retirements for Boeing’s older cargo haulers, such as the three-engine MD-11 flown by FedEx Corp. and United Parcel Service Inc., is expected to squeeze cargo capacity in coming years. Meanwhile, prices for used 777s are falling to the point at which they could be affordably remade to haul packages instead of people. Still, deciding to retrofit the old jetliners isn’t a slam-dunk. Boeing doesn’t want to cut into sales of factory-built 777 freighters, which will be critical to filling its order book as the company shifts toward an upgraded 777X line through the early 2020s. For starters, a passenger jet’s composite floor beams would need to be replaced with metal ones. Then there is the delicate surgery of cutting large cargo doors into the side of the fuselage, requiring engineers to reroute critical flight-control cables that are in the way on the 777-200ER. The process would be somewhat simpler on a long-range sibling, the -200LR, which is better prepared for freight conversion from the outset, Dimitroff said. But Boeing has sold far more of the -200ER: 422, compared with 59 for the -200LR. Prices are falling for used 777-200ERs as airlines replace them with the 787 and the Airbus A350, lowering the overall cost of feedstock aircraft and making conversions more economically feasible. The going rate to customers for the converted freighters would be about $60 million, while a new cargo plane costs about $150 million, after customary discounts, Dimitroff estimated. “I don’t think Boeing wants to make the conversion any cheaper -- even if they knew how -- because they want to sell new 777 freighters,” he said.